The mythical origins of coffee, are steeped in legend and topped with a creamy dollop of speculation. What is certain is that the lush-leaved trees and their precious berries– bright red or green while fresh – originate in East Africa, most likely Ethiopia, where the Kaffa Kingdom may have baptized the plant with its name; another etymology suggests that coffee comes from the Arabic meaning “dark color”, originally used for strong wine, possibly made of the whole coffee cherries. 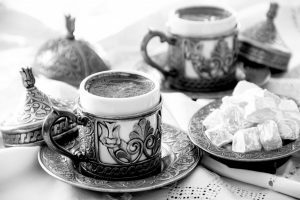 To drink a coffee in Constantinople (Istanbul) is a deeply cultural process that invites to delve in history of the Ottoman Empire, folklore and legends about Coffee. I sit down, take my time and just enjoy, slowly and carefully. To avoid drinking the grounds, one stops drinking when about one fifth of the coffee remains. 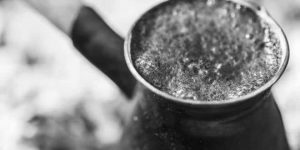 Proper Turkish coffee, or Türk kahvesi, is a thick, strong brew with a layer of grounds settled at the bottom – these days it’s usually prepared by boiling the coffee, water and sugar together in a copper pot (cezve) on a stovetop, though the traditional method is by heating it in sand and coals. I also have to choose if I want it flavored with cardamom, cinnamon, mastic, anise or clove. “Tartar” coffee is with heavy cream, and “kervansaray” with carob (St John’s-bread, or locust bean). 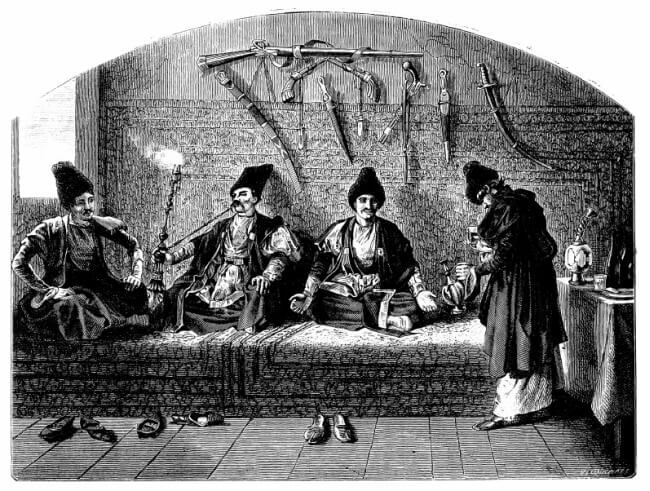 In Ottoman times the drink was served thick, bitter, and near-boiling, with no sugar. Cardamom was the only spice added with any frequency, although in some disreputable quarters, opium and hashish apparently were also stirred in. The Ottoman Sultans used to enhance it with the aroma of exotic spices like saffron and even ambergris (dried whale vomit). There are many stories about how coffee was first discovered but Turkey lays claim to having the world’s oldest method of preparing it. 100% Arabica beans are roasted and then very finely ground; the grains for Turkish coffee are even finer than they are for espresso. Izzet, my kahvıcabşır, will measure one pretty heaped spoonful of this finely ground coffee directly into the Cezve or Ibrīq, a little copper pan, the inside covered in silver, with a long handle, then he will add the sugar and the right amount of cold water. He puts the pan on the gas and then stirs it once with a wooden spoon. 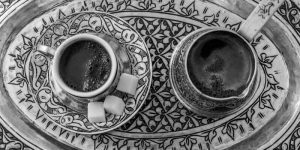 The preparation of Turkish Coffee requires the close personal attention of the preparer because if the coffee is allowed to boil over it will lose it’s foam. Türk kahvesi shall never boil. As the foam will create a ring at the edges of the pot, he lowers the heat, the foam will close and rise upwards. Quickly he removes the cezve from the gas, waits a few seconds and shares out the frothy foam into the waiting cup. Now Izzet replaces it on the gas for a “second rise”. 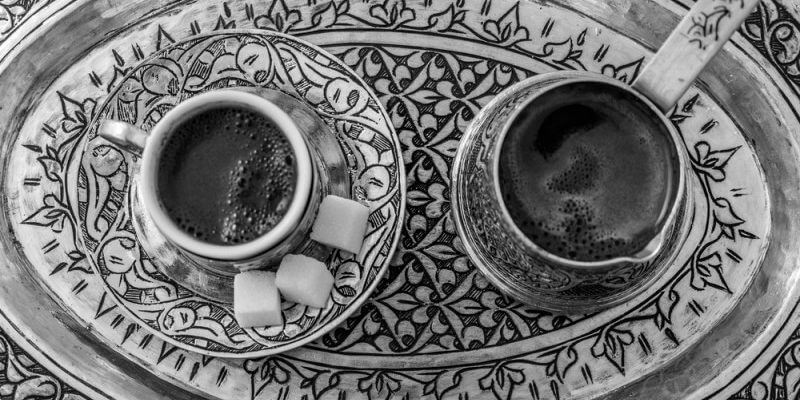 When the coffee froths once again, the Türk kahvesi is ready to be served. The foam of the Turkish coffee is so thick a camel can walk across it. The service of coffee was, and remains, perhaps as significant as the preparation. The elements of service have changed little over the course of its history. “Give the sediment time to settle down in its cup before you take your first siep. Right before you drink, you have to clean your throat with a sip of water. When you are finished drinking, you can eat a Turkish delight, Lokum to sweeten your mouth. With this words, he places the rich decorated tray on the table and leaves me with this delicacy. My Türk kahvesi with cardamom is hidden in a porcelain cup with a copper holder and a lid, a glass of cold water and a little plate with several pieces of Turkish delight. There is no spoon, as it would destroy the foam and disturb the sediment. I drink my coffee slowly, savoring the flavors sip by sip; no rushing. The coffee is strong, but not bitter, and its strength is tempered by the sugar. As with art ’tis prepared, one should drink it with art. Penetrates every tissue; its powers condense. Circulate cheering warmths, bring new life to each sense. The enchanting perfume that a zephyr has brought. Sleep cannot be without a blanket, or coffee without foam. 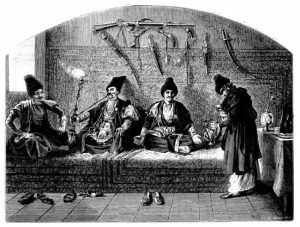 Over the course of my stay in his coffeehouse, Izzet wove in countless interesting stories, as well as his own history with Turkish coffee, he is a wonderful storyteller, sharing old legends about ghost and saints and dervishes. After brewing the beans Solomon presented the drink to the angel Gabriel who used the brew to cure the sick. Toward the middle of the fifteenth century, a poor Arab was traveling in Abyssinia. Finding himself weak and weary, he stopped near a grove. For fuel wherewith to cook his rice, he cut down a tree that happened to be covered with dried berries. His meal being cooked and eaten, the traveler discovered that these half-burnt berries were fragrant. He collected a number of them and, on crushing them with a stone, found that the aroma was increased to a great extent. While wondering at this, he accidentally let the substance fall into an earthen vessel that contained his scanty supply of water. A miracle! The almost putrid water was purified. He brought it to his lips; it was fresh and agreeable; and after a short rest the traveler so far recovered his strength and energy as to be able to resume his journey. The lucky Arab gathered as many berries as he could, and having arrived at Aden, informed the mufti of his discovery. That worthy was an inveterate opium-smoker, who had been suffering for years from the influence of the poisonous drug. He tried an infusion of the roasted berries, and was so delighted at the recovery of his former vigor that in gratitude to the tree he called it cahuha which in Arabic signifies “force”. There are also stories of Ethiopia’s Galla tribe who noticed the energy the felt after eating the berries. The coffee was considered a food and was consumed by these Ethiopian tribesmen who crushed up the complete ripe berry including the hulls and the coffee beans, and then mixed it with animal fat and shaped into round food balls that were carried on journeys for nutrition as well as stimulation. The coffee berries were also placed in cold water and left to soak much like sun tea is made today. There are several islamic traditions that have persisted through the centuries, claiming for “the faithful” the honor and glory of the first use of coffee as a beverage. One of these relates how, about 1258 A.D., Sheik Omar, a disciple of Sheik Abou’l hasan Schadheli, patron saint and legendary founder of Mocha (al-Mukha), Yemen, by chance discovered the coffee drink at Ousab in Arabia, whither he had been exiled for a certain moral remissness. “having nothing to eat except coffee, they took of it and boiled it in a saucepan and drank of the decoction.” Former patients in Mocha who sought out the good doctor-priest in his Ousab retreat, for physic with which to cure their ills, were given some of this decoction, with beneficial effect. As a result of the stories of its magical properties, carried back to the city, Sheik Omar was invited to return in triumph to Mocha where the governor caused to be built a monastery for him and his companions. The dervish Hadji Omar was driven by his enemies out of Mocha into the desert, where they expected he would die of starvation. This undoubtedly would have occurred if he had not plucked up courage to taste some strange berries which he found growing on a shrub. While they seemed to be edible, they were very bitter; and he tried to improve the taste by roasting them. He found, however, that they had become very hard, so he attempted to soften them with water. The berries seemed to remain as hard as before, but the liquid turned brown, and Omar drank it on the chance that it contained some of the nourishment from the berries. He was amazed at how it refreshed him, enlivened his sluggishness, and raised his drooping spirits. Later, when he returned to Mocha, his salvation was considered a miracle. The beverage to which it was due sprang into high favor, and Omar himself was made a saint. The venerable Schadheli being dead, Omar saw in the middle of the night a gigantic specter covered by a white veil. The phantom drew back his veil, and Omar saw with surprise Schadheli himself, grown ten cubits since his death. The mollah dug in the ground, and water miraculously appeared. The spirit of his teacher bade Omar fill a bowl with the water and to proceed on his way and not to stop till he reached the spot where the water would stop moving. The plague meanwhile progressing, the daughter of the King of Mocha fell ill and her father had her carried to the home of the dervish who cured her. But as this young princess was of rare beauty, after having cured her, the good dervish tried to carry her off. The king did not fancy this new kind of reward. 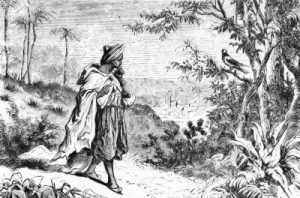 Omar was driven from the city and exiled on the mountain of Ousab, with herbs for food and a cave for a home. To these just complaints, there was heard immediately a song of incomparable harmony, and a bird of marvelous plumage came to rest in a tree. Omar sprang forward quickly toward the little bird which sang so well, but then he saw on the branches of the tree only flowers and fruit. Omar laid hands on the fruit, and found it delicious. Then he filled his great pockets with it and went back to his cave. As he was preparing to boil a few herbs for his dinner, the idea came to him of substituting for this sad soup, some of his harvested fruit. From it he obtained a savory and perfumed drink; it was coffee. The Italian Journal of the Savants for the year 1760 says that two monks, Scialdi and Ayduis, were the first to discover the properties of coffee, and for this reason became the object of special prayers. The most popular legend ascribes the discovery of the drink to an Arabian herdsman in upper Egypt, or Abyssinia, who complained to the abbot of a neighboring monastery that the goats confided to his care became unusually frolicsome after eating the berries of certain shrubs found near their feeding grounds. The abbot, having observed the fact, determined to try the virtues of the berries on himself. He, too, responded with a new exhilaration. Accordingly, he directed that some be boiled, and the decoction drunk by his monks, who thereafter found no difficulty in keeping awake during the religious services of the night. Drink ’round the great cauldron—a circle of cheer! On idle beds of ease surprised them nevermore! 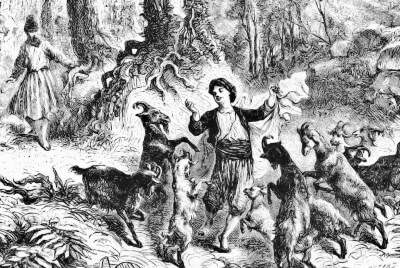 A young goatherd named Kaldi noticed one day that his goats, whose deportment up to that time had been irreproachable, were abandoning themselves to the most extravagant prancings. The venerable buck, ordinarily so dignified and solemn, bounded about like a young kid. Kaldi attributed this foolish gaiety to certain fruits of which the goats had been eating with delight. The story goes that the poor fellow had a heavy heart; and in the hope of cheering himself up a little, he thought he would pick and eat of the fruit. The experiment succeeded marvelously. He forgot his troubles and became the happiest herder in happy Arabia. When the goats danced, he gaily made himself one of the party, and entered into their fun with admirable spirit. One day, a monk chanced to pass by and stopped in surprise to find a ball going on. A score of goats were executing lively pirouettes like a ladies’ chain, while the buck solemnly balancé-ed, and the herder went through the figures of an eccentric pastoral dance. The astonished monk inquired the cause of this saltatorial madness; and Kaldi told him of his precious discovery. Now, this poor monk had a great sorrow; he always went to sleep in the middle of his prayers; and he reasoned that Mohammed without doubt was revealing this marvelous fruit to him to overcome his sleepiness. Piety does not exclude gastronomic instincts. Those of our good monk were more than ordinary; because he thought of drying and boiling the fruit of the herder. This ingenious concoction gave us coffee. Immediately all the monks of the realm made use of the drink, because it encouraged them to pray and, perhaps, also because it was not disagreeable. 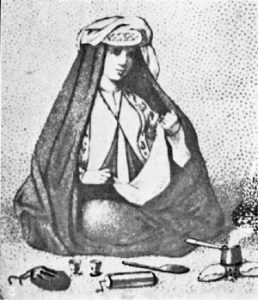 Baba Budan, a Sufi named Hazrat Shah Jamer Allah Mazarabi, is said to have smuggled seven live coffee beans from Mocha to India when he returned from the Hadj, pilgrimage, and planted them on the Baba Budan mountain ranges in Mysore. So broke the Arab monopoly over the coffee trade. An early date of 1385 has been given for the occurrence, but Baba Budan probably went to India no earlier than 1600 and more likely about 1690. The first historical record of coffee drinking is from a treatise on coffee written in approximately 1558. 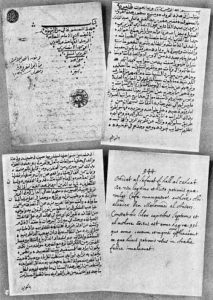 It records a meeting between a Yemeni jurist and Shaykh Jamal al-Din Abu Abd Allah Muhammad ibn Sa’id al-Dhabbani, an imam, mufti, and Sufi from Aden. As al_Dhabbani died about 1470, the account establishes coffee as a beverage by the mid-15th Century. The Abd-al-Kâdir work immortalized coffee. It is in seven chapters. The first treats of the etymology and significance of the word cahouah ~ kahwa ~ قهوة , the in 996 A.H., or 1587 A.D. and properties of the bean, where the drink was first used, and describes its virtues. It also states how coffee traveled from Arabia Felix (Yemen) north to Medina and Mecca, and later onto the big cities of Damascus, Cairo, Istanbul and Baghdad. 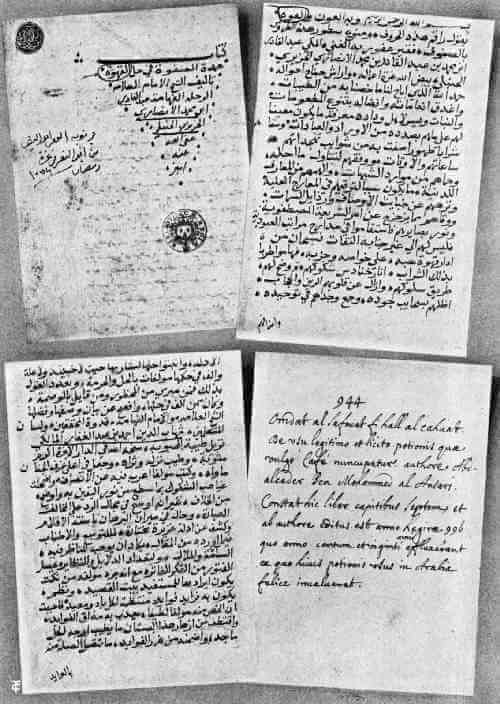 The other chapters have to do largely with the dispute in Mecca in 1511, answer the religious objectors to coffee, and concludes with a collection of Arabic verses composed during the Mecca controversy by the best poets of the time. Coffee had then been in common use since about 1450 A.D. in Arabia. It was not in use in the time of the Prophet, who died in 632 A.D.; but he had forbidden the drink of strong liquors which affect the brain, and hence it was argued that coffee, as a stimulant, was unlawful. Till today, the Wahabis, very powerful in Arabia a hundred years ago, and still dominant in part of it, do not permit the use of coffee. O Coffee! Thou dost dispel all cares, thou art the object of desire to the scholar. This is the beverage of the friends of God; it gives health to those in its service who strive after wisdom. Prepared from the simple shell of the berry, it has the odor of musk and the color of ink. The intelligent man who empties these cups of foaming coffee, he alone knows truth. May God deprive of this drink the foolish man who condemns it with incurable obstinacy. Coffee is our gold. Wherever it is served, one enjoys the society of the noblest and most generous men. O drink! As harmless as pure milk, which differs from it only in its blackness. The object thou of that man’s wish who studies night and day. Who walk straight on in wisdom’s way, nor seek their own repose. Fragrant as musk thy berry is, yet black as ink in sooth! And he who sips thy fragrant cup can only know the truth. For when they thirst and seek its help, God will the gift refuse. 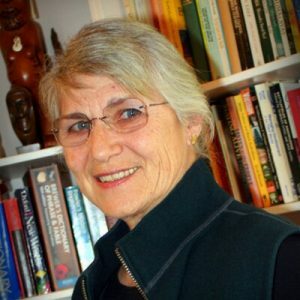 Originally published by Dr. Trish Nicholson at EarthStoriez, republished with permission for educational, non-commercial purposes.